For someone who generally does not enjoy historical fiction, this book was an absolute treat! 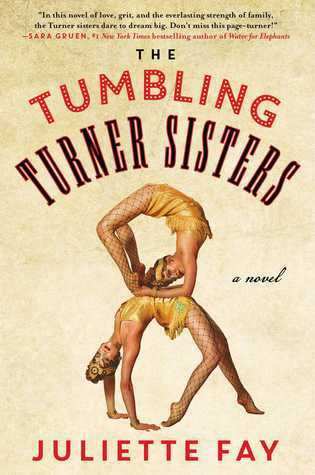 I was thrilled to be so into this crazy and sometimes raucous tale, as I could not help but fall in love with the madcap Turners. Even though I don't generally get into historical fiction, I do enjoy history and especially the era in which this book is set. Vaudeville is an utterly fascinating concept to me, and I felt like this book gave me an insider's look at what the performers actually experienced. I know the author mentioned that her grandfather had been a performer, but I wonder how much came from what he may have shared and how much she thought up. The Turners were definitely a gang of girls that made you love them. Never giving up despite many terrible things and obstacles in their way, they were even inspirational in their devotion to their craft, and one that they had come to out of necessity yet stayed with out of love. Young women with very different experiences but who were devoted to the family above all else. This book was highly entertaining and fast paced with short chapters and I felt swept away in the entertainment of it all. The show must and did go on and this will remain one of my favorite books of this year as I keep thinking about it weeks later.